A: There are two dipsticks on all engine types, the dipstick under the driver’s seat is for the Automatic Transmission Fluid (NOT the engine). The dipstick under the passenger seat is the engine oil dipstick for all engines. However, the oil filling point for a V6 is the one under the Drivers seat, on a diesel it’s under the passenger seat. A: That’s not unusual. The coolant has stopped circulating around the system so the engine temperature will go up a few degrees. This is why, in hot weather conditions, you should leave the engine idling for a few minutes before turning it off. A: Yes, there are differences in length and shape. The diesel version is 54.5 cm long, from top of plastic to the tip, and entirely straight, except for a small kink about 6.5 cm from the bottom. The full indicator is 4 cm from the bottom. The V6 version is 58 cm long, again entirely straight, except for a kink 5.5 cm from the bottom. The full indicator is 3 cm from the bottom. The 2 litre petrol version is not straight, is a lot shorter, with a full indicator 2cm from the bottom. A: (Thanks to “Bongolia” for this response): If he is referring to play when you rotate the prop backwards and forwards then there will be some play. It shouldn’t “clack” as you do it though and the play should not be excessive. But if he is referring to play in the Universal Joint then there should be no play there. Also if you drive the vehicle at varying speeds and you hear a whine from the back, especially as you take your foot off the throttle, that would indicate some wear in the Diff. A: Cover bolts should be tightened in 2 goes, starting with the driver side at the front and working clockwise. 1) 1.5 to 2.9 Nm. 2) 5.0 to 8.8 Nm. A: Twice this summer (2013) we had reported problems from people on European jaunts where this happened. In both instances they turned the engine off prematurely and the temperature gauge, usually steady at 11 o’clock, shot up. It would have been better to let the engine idle for a while. A: If it’s not the plugs, then test the HT leads. If it’s not them, then check the Distribution Cap for worn contacts. While you are at it, make sure the Rotor Arm is not damaged in any way. A: I mentioned this to Ian Taylor, Bongo mechanic extraordinaire, who said it was likely to be a faulty turbo wastegate vacuum pump. He has seen it occur before, when the engine warms up, the valve in the pump sticks open or closed. The pump is situated by the side of the turbo on the chassis leg. A: There are universal ones at a fraction of the cost available on eBay, called “VOS-2 Oxygen sensors”. These will fit OK but you will have to re-splice the connection. A: Your fuel-stop solenoid, which is situated at the top of the fuel injector pump, is probably jammed open. To stop the engine disconnect the solenoid wire. A: Members report that either an Audiovox CCS100 or a Waeco MS50 will do the trick. A: Although not a common problem, it has happened to some others. The pulley is a 2 piece design with a heavy iron outer ring (pulley) – the 2 parts are bonded together with a rubber “sandwich” filling and the idea is that the pulley acts as a vibration damper – the outer “oscillates” with the firing pulses and smoothes out crank vibration. In theory, the outer part of the pulley will have smooth motion as opposed to the inner part experiencing the crank pulses…. when they start to deteriorate a vibration is felt through the vehicle. (Thanks to Dandywarhol). You can obtain new ones (about £200) via the Partfinder Service in the members-area of this website, but if you phone someone like Bell Hill Garage (01373-834252) or one of the breakers, they can usually supply a second hand one for about £65 plus postage. Or ask in the ‘Stuff wanted’ section here. A: The way I understand it is that lots of poor Scots people were forcibly ejected from the Highlands to make way for sheep. But I think you should look this up for yourself. A: The engine coolant temperature sensor is on the on the driver’s side of the head, positioned above the starter between cylinders 2 and 3. A: The idle tickover speed should be between 700-780 and this can be adjusted via the idle control. On the end of the pump there’s a 12m bolt in the middle of injector pipes, try a 1/4 turn at a time. (Thanks to ‘antique’). Also, if the throttle cable has stretched, it can affect the idle. The linkage for adjusting the cable is at the end of the cable, under the driver’s seat. It’s a long threaded bolt with nuts attached either side. You adjust the nuts a little, but take care not to over tighten the throttle cable as this will affect the ‘lever stop’ (idle control). A: The sensor is located on top of the fuel pump under the driver’s seat. You can get sensors from various suppliers including Autolink here. A: The sensor for the scavenger fan is by the handbrake. There are wires going to a little black gadget that protrudes into the engine compartment, this is the device you are looking for. Disconnect the sensor while the fan is running… if it stops, you have found the problem. A: The temperature gauge rarely moves until there is a more serious over heating episode, when it can move rapidly to 12o’clock or even higher. If you think you smell something hot, it’s possible that you have a gunged up radiator. When this occurs, the coolant flows poorly, it won’t be cooled properly and the system will work harder to push it through. If I was you, I would take it to someone familiar with Bongo coolant systems to get the system pressure tested, flushed through and refilled. It is also possible that you will need to replace the radiator. But only an expert will be able to tell. A: The engine number is stamped on the front of the engine block, on the driver’s side, just below the cylinder head. A: It’s an engine “pre-heat” button. 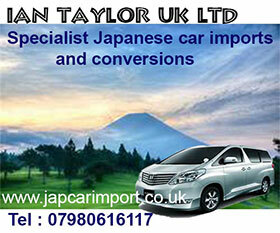 Your vehicle comes from the North of Japan and had to be started in extremely cold conditions. It’s probably got 2 vehicle batteries as well. The button closes a valve in the exhaust, so all the gases go back in to the main engine compartment to heat it up more quickly. Unless you live in somewhere where the temperature regularly goes below minus 10C (like Barnsley for instance), you will not need to use it. A: The standard value when cold is IN: 0.1.mm plus/minus 0.05mm, OUT: 0.2mm plus/minus 0.05mm. A: It is due to a fault with the fuel cut-off solenoid. You need a new solenoid. A: We have heard of this happening before. It is probably the thermostatic switch which controls the main engine fans. It is found under the drivers seat towards the rear of the engine block and is bolted into the side of the engine. A: You have 4 options. 1) Find someone who is breaking a Bongo. Check with dealers here or also ask in the ‘Parts wanted’ section on the forum. 2) If the crack is very minor, you may be able to get the cylinder head reconditioned (see the members-only area of this site). 3) New cylinder heads are readily available, try one of the suppliers on the club. 4) Try a Mazda main dealer. They may be more expansive then the other options. A: I have seen these symptoms, once when I had a vehicle with a missing temperature sensor and once with an overheating problem. As you appear to have ruled out overheating then I would think it’s the sensor in the top of the engine bay or failing that, the ECU. A: Yes, that’s what’s recommended. It’s to let the turbo cool down. If not, there’s a possibility that the oil can get too hot, carbon-up the oilways & block the oil feeds to the turbo. Its a judgement call but maybe if you have done a short run, let it cool down for 30 seconds or so on tickover, if it’s worked hard pulling up a long incline, let it tick over for a couple of minutes. This is for any turbo, not just Bongo/Freedas. A: Assuming you have also changed the oil, this is difficult to diagnose but might be a stuck hydraulic tappet (if it’s a rattle) or maybe a manifold stud has snapped. You may need to go to a garage for diagnosis. A: The injector pump is gear driven from the crankshaft and the camshaft is belt driven. The engine is an ‘Interference’ engine meaning that if the cambelt breaks, the momentum of the crankshaft continues to drive the pistons and damage is likely to occur to the valves. (Update 13/4/04: Further to my emails on this subject. we have now replaced the timing belt on our Bongo. The whole process took 2 hours. The cam shaft is driven from the injector pump which is driven from the crankshaft, making the belt somewhat easier to change. If the cambelt fails not only will the engine stop but you will almost certainly have an expensive coming together of pistons and valves. Not worth taking the risk, replace on schedule. Hope this helps. Philip (Honorary Technical Advisor and Chief Cook and Bottle Washer to Sheila) Further info on cambelts can be found on the members-only area. A: As far as I can recall, there are marks on the two pinions, with corresponding marks on the engine block. If these are aligned, the timing is correct. A: Yes, it’s at the bottom of the radiator. A: The radiator you can see there is for the air conditioning system; the engine radiator is behind it, safe from anything short of a tactical nuclear weapon. (Update from Pete: I’ve fixed some galvanised steel grilling around the front anyway, just to be on the safe side). A: If it’s just sluggish with no accompanying smoke, there are several possible causes. Check fuel filter, air filter, turbo to intercooler pipes, inlet manifold studs (these occasionally shear), & put some injector cleaner through it. Alternatively you could put a horseshoe in your boot. A: It’s because the sump has a 6 litre capacity. A: It’s an electrical issue, and more than likely it’s a distributor problem. Lift the passenger seat, dry off the distributor (front near-side), good spray with WD40, then check each plug well (both sides) for any accumulated oil. Also clean the rubber seals around the spark plug caps as they accumulate dirt. A: It’s 1.1 mm. It’s the same for the 2 litre version as well. A: We have had this reported before and it turned out to be a faulty diode on the alternator. But it could be the sensor which received a signal from the injector pump. A: Assuming the battery itself is still OK, this is likely to be caused by somethjing called “Parasitic Ampergage Draw”. If you search on You Tube there is an excellent video about possible solutions, but in brief it is possible that one of the many relays is not switching off correctly. To find out which one is a complex procedure whereby you connect a multi-meter to the battery and measure the “draw” in milli-amps. You then remove the bonnet and the interior fuses one-by-one until you find the culprit. A: Disconnect the original cable at both ends if possible and replace with the two fused cables feeding into the Split Charge Relay. A: If it was the starter motor it would try to turn over. But if it is rapid clicks (or nothing at all) it is either the battery or the alternator. Try jump strating your car with another battery. If it does not start, it is the alternator. If it starts, your battery has died. A: If your speedo has been rechipped to read in MPH rather than Km/h, then the pulse generated may interfeer with the ECU, which sends a message to the hold light. Apparantly. A: You dont need to remove them to size them as the difference is all above where the main thread finishes. this thread is visible. Long ones have about 37-8mm above the last thread, short ones have 27-8mm above the last thread to the tip. A: You could try a Motaquip VBY44, type 249, 90 amp hour. You can get these for about £90. A: Bongos with cold start packs, like yours, have different starter motors. But the 9 tooth motors are interchangeable with the 10 tooth motors, so they will not experience any problems. A: These are available from many parts suppliers including Autolink for around £100. Their website is at www.boundville.co.uk or by phone on 01489 877770. A: I bet you have a leisure battery installed, because this sounds like the split charge relay is causing the problem. Some split charge relays tap directly into the alternator, which causes a slight current draw…it’s this that makes the light(s) glow ever so slightly. It shouldn’t cause any damage though. Or there could be a fault with the Alternator. (Allans Vehicle Services). A: It will be the starter motor, or possibly the starter solenoid. This is the small round device attached to the starter motor. On the end of the solenoid are two terminals one goes to the battery via a heavy duty cable the other is a short cable that goes to the starter motor. If you can, try shorting them together. If the starter turns then your starter is ok but your solenoid is not. If you get sparks on the terminals and nothing else then your starter is jammed. A: It is located under the main block of the engine. It is very well shielded by the plastic undertray. With the tray removed it is easily accessible from underneath. A: Tom replies: I had these symptoms and in my case it was a defective switch on the cambelt housing which senses the revs, it is a Mazda part, generator pulse WL0120H10B. Or there could be a loose wire/bad earth problem, check the connections behind the face, the red wire to the alternator and the sender unit from the diesel pump. (Allans Vehicle Services). A: The alternator returns 40 amps when idle, and 91 amps at 2000 rpm. A: Commonly, if the speedo is not ‘chipped’ (speedo reads in kms or miles, odometer reads in kilometres), this is caused by a bad earth or loose connection, so check the connections behind the speedo. If there is a chip fitted (both speedo and odometer read in miles) then the chip is commonly faulty. You either need to replace it or remove it, reconnect the cables and change the speedo face again. (Allans Vehicle Services). “Grumpo” reports:- The speedo is driven by a low voltage square wave frequency generated by the gearbox transmitter. As it’s virtually impossible for anything else to simulate this signal I can only assume that that the speedo head can also respond to a DC voltage and drive it full scale. If this was the case then you should also get a hold light error, flashing 1 second ON and 1 second OFF, although a DC signal may confuse it. If your odometer reads in MILES then a frequency converter “Chip” must be fitted behind the instrument panel and I would suspect that this is faulty and sending DC on the output to the speedo. I would not suspect anything prior to the “Chip” because the circuit only responds to the rising edge of the frequency and it would not pass a DC voltage if it was in good condition. If you do have a converter “Chip” fitted I would first remove this and re-connect the original cables, this will then convert the speedo back to reading kilometers and with a bit of luck solve the problem. If you don’t have a “Chip” fitted and your odometer reads Kilometers then you will have to use an oscilliscope to test the actual input to the speedo head to determine if the speedo head or gearbox unit is the faulty part. A modern electronic volt meter would not reliably block the DC component whereas an old moving iron meter may give you some indication. A: You have 2 vehicle batteries working in parallel. This is to allow cold starting in particularly cold climates (like northern Japan. Or Leeds). They both discharge at the same rate. 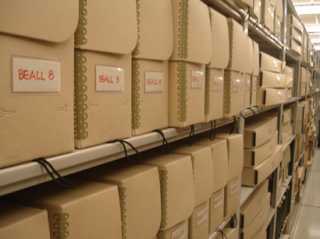 The second battery is surplus to requirements in Northampton. When fitted in Japn, the ‘cold climate’ system includes the twin batteries, and a ‘cold start’ switch on the dash which operates a valve in the exhaust, allowing exhaust gases to re-circulate and heat the engine more quickly. A: If the leisure battery is being charged from the mains (or by the alternator) then it will share the charging current with anything that is loading the leisure battery. If you are taking more out than the charger (or alternator) is putting in then the battery is not being charged. Waeco do a battery charger that has a main output for the leisure battery and a secondary lower current output to keep the engine battery just trickled charged when connected to the mains. They are called Compact switch-mode chargers. A: You need a minimum of a 95a/h battery. The more the better. There are 3 references you can quote. Either a UK 249 or a Euro 068 or a 335. A: It is OK to earth the battery through the chassis. The earth strap is best bolted straight to the chassis underneath the coolant expansion tank. It’s best to use a split charging system rather than run in parallel. If it just connected in parallel, that means it will be charged by the alternator in parallel and both batteries will be run down equally by starting the vehicle and also by using power for running stuff inside whilst parked like lights and TV, so if you’ve run down the battery with the telly, you’ve run down both batteries and it won’t start in the morning. A: The battery isn’t man enough for the job. For a single-battery vehicle, the battery needs to be a 335E, which is a lot more than 60 amps. Generally I have found that fitting the biggest one you can is cheaper in the long run. Alternatively a second battery can be fitted, as in some Bongos. 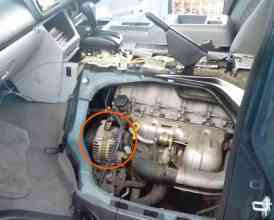 1) The connector plugs from the engine to the gearbox which sit on top of box. Undo them, clean them up & WD40 them. 2) Try the red wire from the alternator. 3) TDC sensor on the fly wheel. It’s mounted on the front edge of the gearbox. 4) The alternator’s diode may have deteriorated. A:It’s the lump on the side of the starter motor… once the starter motor is removed, it comes apart quite easily but you have to be careful bits don’t spring out and get lost or damaged. There’s also a possibility the starter motor brushes are worn down and aren’t making good contact with the commutator. A: This sounds like the temperature sensor that lives under the centre console. I know this causes the glow-plug light to flash if there’s something wrong with it. In fact it’s not unknown for this to be missing entirely. If that area has recently been disturbed, the sensor may have been knocked, so check it for a tight connection. A: It sounds like the sender is faulty. To prove this you need to earth the lead from the sender unit (located left side of cylinder head), with the ignition on. If the gauge goes to hot it means the sender is faulty, if not it suggests the gauge is faulty. A: Member Les Walshe says “I had the same problem. I took it into the dealer and this is how the mechanic fixed it. On most vehicles the fuel tank has to be dropped, but not on Bongos. In the rear between the 2nd and 3rd row of seats on the drivers side there is a plate in the floor under the carpet. (See photo). There are 3 phillips screws that secure it to the floor. Undo them, remove the plate and there is the sender unit. Apparently the electrical connections (I assume they are spade connectors) on the wires leading from the gauge to the sender unit are not very good at all. He cut them off and put on new connectors that were better fitting and that sorted the problem out, it’s working fine now. The mechanic does suggest that the rear seats are taken out first as it was a bit of a squeeze trying to do the work in between the seats. A: If the poor starting is accompanied by white smoke, you need some new Glowplugs. These little devices sit in the cylinder head and super-heat to 800 degrees centigrade to aid the ignition sequence. Unfortunately, it is a fact that many Bongos are not used to cold weather, and therefore original glow plugs will loose their capabilities in the English winter. Glow Plugs are now stocked by the Owners Club and are available on the Merchandise page. A: It’s a switch for the ‘cold climate’ system. It helps the engine to reach operating temperature more quickly. (Member Martyn May offers this observation) In cold weather once the engine is started you flick the switch and it will help heat up the engine quicker. But having suffered replacing the glow plugs on my vehicle twice in the short time I have had the vehicle I do not recommend this process without further investigation, as I suspect that this keeps the glow plugs glowing for longer than normal, and I already know that the glow plugs can function up to 5 to10 full minutes after starting the engine in cold weather to help with the emissions. Now when I start my vehicle I maintain the revs at over 1,200 rpm which keeps (we think) the glow plugs from glowing too long, after about 5 minutes I let the engine settle down to it’s normal tickover speed and it would appear that the glow plugs do not kick in again, and since I have started this process I have not had any trouble starting the van in these cold mornings….roll on Summer. A: First Stop Decals are no longer trading. Instead the business has been transferred to Sheffield based Bongo Decals. 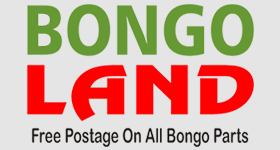 You can visit their website atwww.bongodecals.com or phone Andy on 07510-347131. A: It just snaps off. It might be best to use a large sucker like panel beaters use. It has retaining clips. Here’s what it looks like from the inside. A: Take a very narrow bladed flat headed screwdriver, and insert into a small slot at bottom of the mirror base (look from underneath, you’ll see a small tab with a metal flange). The screwdriver needs to go quite far in at an angle, then lever the mirror upwards off the metal mount. A: Break the old mirror glass to remove it. Heat up the plastic surround until it expands – a hairdryer is probably safest. Once expanded the new glass will drop into place. Don’t turn it upside down until it’s cool or the glass will drop out! A: Replacing the full units could be costly, around £200 per unit. It’s possible that there the original Japanese owner inserted a yellow film on the inside of the lens to aid city centre driving in smoggy conditions. If he has, peel it off. Alternatively they may need a good clean. Try Auto Glymm. A: The chrome covers are difficult to remove but it can be done if you’re careful. There is a siticky pad about 4 inches square between the chrome cover and the plastic mirror housing. You then need a heat shrink gun and constantly move it over the whole chrome area until you can hardly bear to touch the surface, then immediately grip the top and bottom edges of the chrome cover and pull as hard as you can. A: Although some people have reported that nail varnish remover will do the trick, this is not to be recommended as most of them have plastic dissolving solvent in them. Instead, we recommend using Metallic T-Cut. A: You have 4 choices. A: The spring clip that holds the headlight bulb in place is barely up to the task on a bongo. It sounds like your headlight bulbs aren’t sitting flush in the headlight aperture. If this is the case, the light can bounce off the bottom of the reflector, then bounce upwards, causing a lot of light refraction that obliterates the defined beam. Before you splash out on new bulbs, it may be worth checking that they are indeed sat properly in the headlight unit. A: You have inherited a very rare item, the Japanese electronic clothes line. The inventor of the Mazda Bongo, Takeashita Inamoto, originally designed the Bongo so that Japanese travelling salesmen would be able to save money on hotel charges. But following the initial prototypes, feedback was received that businessmen had a) nowhere to watch pornographic TV channels, and b) nowhere to dry-clean and press their business suits (there is no such thing as the Corby Trouser Press in the Far East). Although the TV side of things was quickly rectified, the issue of where to hang your suit has still not been fully addressed. The wire (and jack) to which you refer was one of a number of doomed attempts to address this problem in the early part of 1995. A: As long as you keep them covered in public, I think you should be OK.
A: The front windscreen and side front windows must allow at least 70% of any light to be transmitted through the glass. There are no restrictions on other windows. Note that it is also an offence to try and sell a vehicle with excessively tinted front windows. A: 321 Away (Wokingham) stock these. You can contact them on 01784-482158. Their website can be found here: http://www.321away.com/parts_service.html Or try one of the breakers on the Bongo Fury website. 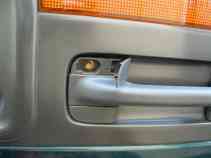 A: You need a VW T3 2 piece awning adapter kit. No drilling necessary! It simply clamps onto your gutter rail with 2 brackets, and each bracket is bolted to the back of the awning box. If you need to remove the awning it is a simple case of undoing the clamps. A: It’s a drive away awning for f*** sake, not a ******* house! Of course it has some gaps and a draft! You are meant to be camping and experiencing the great outdoors! If you don’t like the fresh air, stay at home! No, you can’t send it back! A: 332 x 178 mm front & rear. A: You have been misinformed. There is no law against bull bars at all. You can fit them on a Smart Car if you wish. A: Because bullbars are not standard Mazda fittings then there are no standard fittings available to my knowledge. But any good metal fabricator should be able to knock you some up fairly cheaply. Pajero and Land Rover owners do this all the time. A: You should drain the water tank at any time of the year if you are not using it. This is a sensible health precaution. But during the winter months, special care should be taken because freezing water can split the tank and pipes. If you are doing any winter camping, you may wish to consider purchasing a small 12v immersion thermostatically controlled water heater to ensure that it does not drop below freezing. But if you have cabin heating in the rear, you do not have any cause for concern. A: The Fiama roll-out awning you refer to is very heavy, and requires a special type of bracket which are available from AVA. The sills on the SGL will not take the weight, so there is no option other than to drill in to the van. A: Yes. If you supply a photo and the chassis number to AVA Leisure, they should be able to help you out. A: No it’s not. You can either get a new one from AVA Leisure, or, according to member Graeme McMurchie, what you can do is……. I tried this once when I had an old Alfa and couldn’t find a mirror glass the right size and it worked really well. Use the exisiting mirror as a template. Trace it through onto a piece of paper. Take it along to your friendly glazing shop and ask him (Tell him what it’s for) to cut a piece of mirror for you. A couple of spots of mirror glue stick it onto the backplate. At the very least it gets you by until a replacement can be found. Mirror glass is also readily available from parts suppliers on the main website. A: We recommend the Fiamma F45i. Typically these cost upwards of £260. Fitting is about £150.